Sat on a train, I overheard a refreshing view on IT recruitment this week. I was trying not to listen to the conversation the chap opposite was having with his office, but you know how it is!? The man mentioned IT Project Management and was discussing a strategic hire that his firm had to make … so as an IT recruitment specialist, naturally my ears pricked up! Many firms see recruiting as a chore, something to be crowbarred into a busy schedule, a side issue that gets in the way of the day job. Not this guy! No sooner had he put the phone down to (one assumes) his PA, he was on a call with (one assumes) his HR director. It was fascinating hearing him whittling down candidates he wanted to interview, he had obviously read and digested about a dozen CVs and the reasons he gave for each “yes” or “no” decision were thoughtfully based on how he thought each candidate matched the company’s values and culture – the words he kept using to define this were innovation, integrity, and industry. Sadly, the train pulled into my station before there was a break in his calls long enough to introduce myself so, as I got up to alight, I slid a business card over to his side of the table. Never miss an opportunity! I’ve always believed that the greatest return on investment that you can get from any recruitment process comes from closely aligning the talent you hire with your culture. If you’re using a recruitment partner, make sure that they understand your company or organisational culture too! I’ve always seen recruitment as a huge privilege. When I’m asked to help recruit talent for a client it’s a real honour, to be asked to represent your firm and try to attract the talent who will achieve your business goals – that’s a big deal! The least I can do is get to know your culture and who will fit it perfectly. The biggest challenge for many firms and IT organisations is that they don’t know what their culture is. Or if they do, it’s a little vague or subjective and open to interpretation or it’s just not unique to them. 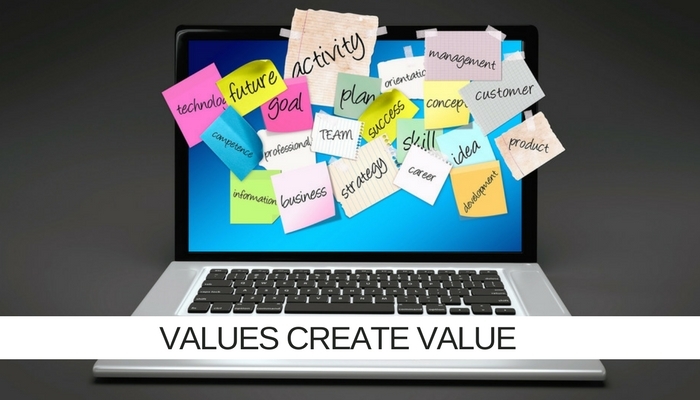 Values create value! I love that! His argument is that there is tangible economic and commercial benefit from recruiting talent aligned with your business or organisational culture. So, if you don’t know what your culture is maybe it’s time to work it out. It will give you one of the most powerful tools against which to measure prospective talent for suitability. It has to mean something though. “We think in full-colour pictures over black and white numbers” – I still smile at this. One of the values of a company I worked with years ago – try telling that to the CEO when sales take a dip. Nice words, creative, but what does it actually mean? Over my career I’ve worked with IT organisations who have proudly trumpeted mission statements like “To discover, develop and deliver innovative IT business solutions” (yeah, you and every other IT team on the planet) and “Developing the industry’s best IT solutions” (right, as opposed to developing the worst?). And it’s easy to recruit against too. Take “humble”, when SendGrid interview they literally do a pronoun count. They count the number of times a candidate says “I” and how many times they say “we” in answer to questions like ‘what’s the thing you’re most proud of that, you’ve accomplished to date?’. Too many “I”s and you’re not progressing to the next stage because you won’t fit the culture – no matter how good you are at the advertised role. The chap on the train was very clear, two candidates might have the same experience and the same qualifications but the right candidate would be the one who fitted their business culture … industry, innovation, integrity – you could easily fit that across the bottom of a coat of arms! What words would be on the bottom of yours? That’s your template for your next culturally aligned IT hire. Previous Still haven’t found what you’re looking for? Next Are the greatest IT Change Managers now facing the greatest change?